Tinting is a fun modification skill — you can completely change the look of your things almost instantly, or match colors easily. Always practice on something copyable first! This is the easiest thing to do — BUT you never want to do it by accident (I once tinted someone’s entire house green. Oops.). 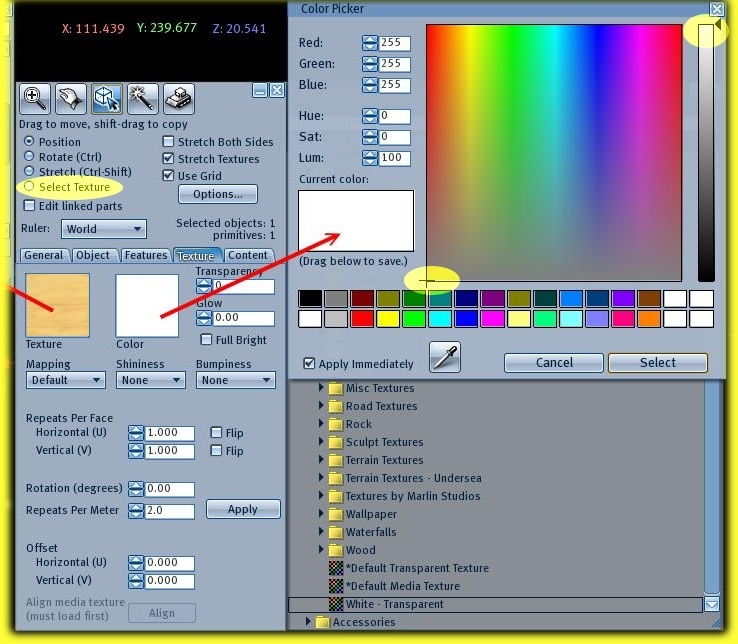 Click on color square (on the right) so that the color window comes up. Click a color square at the bottom closest to what you want. Move the crosshairs (in the big square at the top) around to adjust color : near the top are brighter colors, more subtle as you move down. To darken or lighten, move the slider on the right up and down. TIP: If you want to have NO color, choose white. Edit&gt; check the EDIT LINKED PARTS box. R-Click a prim. then hold down the SHIFT key and click on all other prims you want to tint. Tip: To tint more than one prim (eg Several pillows at a time), for step #2, hold down the shift key and click each prim you want to select. TIP: Sculpted prims have only one face so if you select one, the whole thing will be tinted. SHORTCUT: My usual way is to select the faces or prims I want to tint a certain color (by holding down the shift key and selecting them all), then last of all selecting the face with the tint I want to match. 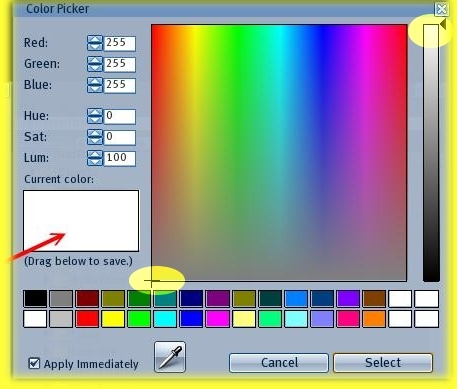 Then I open the color window and choose select. Follow the instructions above for selecting an object, prim, or face, then go to the Texture Tab and increase the ALPHA / TRANSPARENCY level (at the top right) — to make it invisible, go to 100%.